Mahatma Gandhi Institute of Pharmacy 1, Junabganj, Lucknow - 227101, Uttar Pradesh, India. Institute of Pharmacy 2, Chhatrapati Shahuji Maharaj University, Kanpur - 208025, Uttar Pradesh, India. ABSTRACT: In response to the spacious propagation of bacterial contamination stimulated by pathogens, the evolution of novel therapeutics with eminent antibacterial action is of avid concern. When the skin unity is ruptured accidentally or intentionally, its natural defenses will thus be vitiated, and topical medication may be prescribed. Topical medicaments are designed to either obliterate or inhibit the augmentation of pathogenic microorganism and can be consumed for both prophylaxes as well as treatment of superficial infection. Here is a novelize graphene-usnic acid conjugate was developed by way of a mere non-covalent process, and the loading and release demeanor of usnic acid on graphene were investigated. An effective loading of usnic acid on graphene prevailed at the initial usnic acid assiduousness of 300 mg/ml. The developed conjugate was embedded into biocompatible Eudragit polymers to formulate topically active microspheres. Formulated microspheres were characterized by FTIR, TGA, and graphene. Antibacterial activity was studied by the broth dilution method. Results disclosed that amalgamation of graphene and usnic acid had enhanced antibacterial activity against pathogen S. aureus. The outcomes-focused potential of formulated graphene-based microspheres for effective management of topical skin bugs and shed light on application of carbon allotrope graphene nanoplatelets in the arena of biomedicine. INTRODUCTION: Graphene, a monoatomic broad layer of sp2, bonded carbon atoms 1 and a novel nanomaterial has elicited enceinte attention throughout the scientific community ranging from drug/gene delivery, biological sensing, imaging, anti-bacterial materials to less spacing is required between biocompatible scaffold for cell culture 2. The intensive research on the bio-applications of graphene is owed to numerous riveting properties such as high specific surface area (2630 m2/g), intrinsic biocompatibility, eloquent biological/ chemical functionalization also multiple attachment sites, tremendous absorption capacity and cytotoxic activity to suppress the growth of bacterial cells 3. Graphene with their highly piercing edges is amenable to detrimental of bacterial cell membranes. Commonly the broadly accepted mechanisms of the antibacterial activity of graphene include the synergistic outcome of membrane perturbation to the cell envelope and oxidative stress, which are kindred with the physical and chemical properties of graphene 4. Nanoscaled drug carriers have appeared as a bridge linking nanotechnology and modern drug delivery, implying nanoscaled materials such as microspheres, microparticles, nanoparticles, and carbon nanotubes. The drug is loaded on these nanoscaled materials by numerous kinds of mechanisms such as embedding, surface absorption, hydrogen bonding and former types of interactions. Graphene besides can be inserted with hydrophilic groups like hydroxyl and carboxylic and can be well spread in aqueous solution, which makes it a promising material as a drug carrier substance 5. The tremendous act of graphene or graphene derivatives, merged with the improvement of the polymer matrix, constructs graphene/polymer composites appropriate for function in conductive devices, covering and biological and pharmaceutical field 6, 7, 8. Microspheres configured to control drug relinquish into the skin assure that the drug remains localized at the diligence site and does not unnecessarily embark into the systemic circulation 9. They dissemble as reservoir acquitting an active ingredient over a protracted period asserting competent drug concentration in the skin and at the identical time, slenderizing unsought side effects 10. Hence is peculiarly crucial in the treatment of infectious diseases owed to the obstruction of antimicrobial resistance. Such delivery systems may also aggravate drug stability or meliorate incorporation into pertinent vehicles 11. Usnic acid [2, 6-diacetyl-7, 9-dihydroxy-8, 9b-dimethyl -1, 3 (2H9βH)- dibenzofurandione] a prominent example of antimicrobial compound usually found in the genus Usnea is a yellowish pigment acquired by various lichen species. It has been authenticated to have antihistamine, spasmolytic, antibacterial, antiviral, analgesic, antipyretic, antiproliferative, anti-inflammatory, antibiotic and as an immunologic modulator property 12. Herein, we report a novel non-covalent conjugation formed by graphene with usnic acid and investigated the loading and release demeanor of usnic acid by graphene. Moreover, the interaction between the graphene and usnic acid was inquired by spectroscopy. MATERIALS AND METHODS: Graphene powder was purchased from Reinste Nano Ventures, Noida Uttar Pradesh, Usnic acid procured from Triveni Chemicals G. I. D. C., Ahmedabad, Polymers (Eudragit RS100 and Eudragit RL 100) were purchased from Yarrow Chem. Products, Mumbai. Polyvinyl alcohol, chloroform, methanol were purchased from S.D. Fine Chemicals Ltd., Mumbai. Dialysis membrane-110 was purchased from Himedia Laboratories Pvt. Ltd. (Mumbai, India). All other reagents and chemicals used were of analytical reagent grade. Conjugation of Graphene Usnic Acid: Graphene powder (100 mg) weighed and was added in methanol (25 ml). After that, the graphene methanol dispersion was stirred for 12 h, usnic acid powder (200 mg) was taken and added in methanol (25 ml), stirred for 12 h. Both the dispersions were mixed and stirred for the next 12 h. The resultant centrifuged at 15000 rpm for 30 min and allowed to dry. The developed conjugate was analyzed through UV spectrophotometer. Preparation of Graphene Usnic Acid Conjugate Loaded Microspheres by Solvent Evaporation Method: Graphene usnic acid conjugate microspheres were prepared by using a solvent evaporation method consisting of individual polymers Eudragit RL 100 (ERL) and Eudragit RS 100 (ERS). The polymer was dissolved completely in 5 ml chloroform as the internal phase using a mechanical stirrer at 800 rpm and after that usnic acid 50 mg added followed by stirring at 800 rpm. The solution was then added dropwise with a syringe (24 gauzes hypodermic needle) to a solution of polyvinyl alcohol (PVA) in water (0.5% w/v) which acted as the external phase. This is the basis of the technology because most of the solvent disappears by evaporation. Solvent removal and hardening of the microspheres was done by continuously stirring the mixture for about 5-6 h. Microspheres were isolated by filtration and washed with n-hexane several times to remove residual PVA and solvent 13. 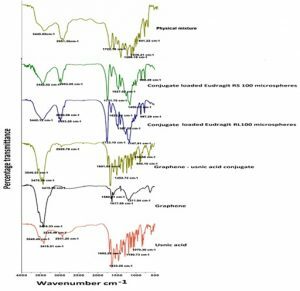 Fourier Transform Infrared (FTIR) Analysis: FTIR spectroscopy was performed on Fourier transform infrared spectrophotometer. The drug and potassium bromides were mixed, and pellets were prepared by compressing the powder. FTIR study was carried out on usnic acid, graphene, physical mixture, polymers (Eudragit RL100/ Eudragit RS100) and formulated microspheres. Spectral scans were taken in the range between 4000-400 cm-1 on a Nicolet, FTIR 8400S, Shimadzu, Japan instrument 14. Thermal Gravimetric Analysis (TGA): TGA recorded the decrease in the weight of the sample as a function of the temperature. Graphene, usnic acid, polymers (Eudragit RL100/Eudragit RS100) and formulated microspheres were placed in aluminum pans and heated in nitrogen atmosphere at 10º C/min utilizing Perkin-Elmer TGA-7. The heating range of TGA-7 was 20 - 900 ºC 15. 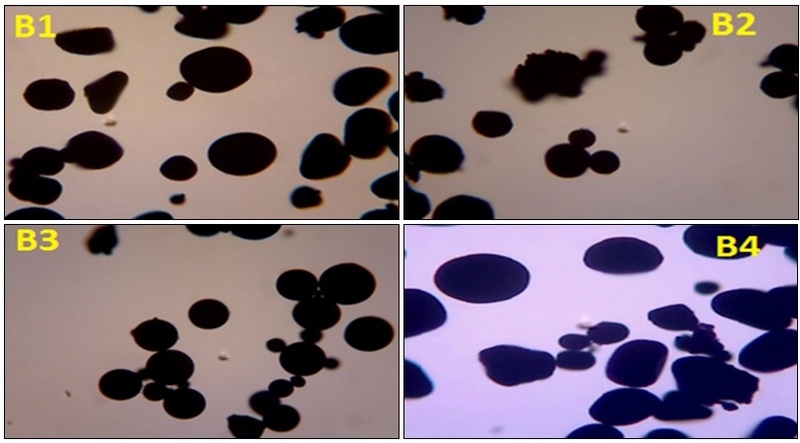 Particle Size Determination: The particle size of the microspheres was determined by using optical microscopy method, (Olympus Dewinter, New Delhi, India). A small number of dry microspheres were spread over a clean glass slide, and the average size of 20 microspheres was determined in each batch. The slide containing microspheres was mounted on the stage of the microscope, and approximately 20 particles were measured using an ocular micrometer. Scanning Electron Microscope (SEM) Analysis: Scanning electron microscopy has been used to determine particle size, surface morphology, and texture. SEM studies were carried out by using a scanning microscope. Surface topography and morphology examination of the dried microspheres was carried out using a scanning electron microscope equipped with a secondary electron detector at an accelerating voltage of 10 KV. Dry microspheres were placed on an electron microscope stub covered with a black adhesive tape and observed under a microscope after applying vacuum. Each sample was coated with gold to a thickness of about 30 nm in a vacuum evaporator 16. Determination of Drug Content: The various batches of the microspheres were subjected to drug content analysis. Accurately weighed microsphere samples were mechanically powdered. The powdered microspheres (5 mg) were dissolved in adequate quantity (10 ml) of phosphate buffer pH 6.8 and then filtered. The UV absorbance of the filtrate was measured using a UV spectrophotometer (Shimadzu, pharma-Spec1700) at 291 nm. In-vitro Drug Release by Dialysis BAG Method: Accurately weighed microspheres equivalent to 10 mg usnic acid drug was added in dialysis bag containing 5 ml methanolic phosphate buffer pH 6.8. Tied dialysis bag was kept in a beaker containing methanolic phosphate buffer pH 6.8 and allowed for diffusion for 8 h. 5 ml aliquots were withdrawn and replaced with the same medium to maintain sink condition at predetermined 30 min time interval. Each aliquot was analyzed through UV-visible spectrophotometer at 291 nm, and drug release profile was studied 17. In-vitro Anti-bacterial Activity by Microtiter Plate Method (S. aureus): The microdilution assay was performed by the Clinical and Laboratory Standards Institute guidelines (CLSI). MIC (Minimum Inhibitory Concentration) values and % growth inhibition determination against S. aureus was determined by the CLSI broth microdilution method. Overnight cultivated different bacterial strains were suspended in RPMI-1640 (Sigma Chemical Co, St. Louis, MO, USA) supplemented with L-glutamine and 2% glucose buffered to pH 7 with 0.165 mol/L morpholine propane sulfonic acid (MOPS) to yield 1-5 × 105 CFU/mL in a flat-bottomed 96 well microtiter plate. The test solution was incubated for 72 h and analyzed through spectra max at 530 nm. Fourier Transform Infrared (FTIR) Analysis: FTIR spectra were recorded to assess the compatibility of the drug, and excipients. FTIR spectra of the drug, graphene, Eudragit RS100 and Eudragit RL100, and conjugate formulated microspheres were examined. All characteristics peaks of usnic acid, graphene, conjugate, Eudragit RL100, and Eudragit RS100 were ascertained in the FTIR spectra of microspheres. The results showed that no chemical interaction or alteration took place during formulation of microspheres and drug was found to be enduring. FTIR spectra of usnic acid, characteristic peak of N-H stretching at 3415.51 cm-1, C-H stretching at 2931.20 cm-1, C=C stretching at 1633.25 cm-1 were obtained. FTIR spectra of graphene showed a characteristic peak at 1637.65 cm-1 C=C stretching, 1617.99 cm-1 C=C stretching was obtained. Graphene usnic acid conjugate showed FTIR spectra at 3475.26 cm-1 N-H stretching, 2929.78 cm-1 C-H stretching, 1691.60 cm-1 C=C stretching respectively. FTIR spectra of PVA revealed C-CH2 is bending alkane stretching at 1458.87 cm-1, N-C=O carbonyl stretching alkane vibration on amides at 1735.87 cm-1, C-H bending vinyl stretching at 1375 cm-1, and C-H stretching in CH2 at 2932.49 cm-1. FTIR spectra of Eudragit RL 100 and Eudragit RS 100 were exhibited O-H stretching of hydrate band at 3429.99 cm-1, C=O stretching at saturated aldehyde at 1735.65 cm-1, N-R stretching of quaternary amine salt at 1384.86 cm-1, and C-O-C stretching of a strong band of ester at 1735.65 cm-1. All characteristics peaks of usnic acid, graphene, graphene usnic acid conjugate, PVA, Eudragit RL100, and Eudragit RS100 were observed in the FTIR spectra of microspheres. The results showed that no chemical interaction or alterations took place during the conceptualization of microspheres and, the drug was found to be compatible with excipients. Thermal Gravimetric Analysis: TGA recorded the declension in weight of the sample as a function of the temperature range 20 ºC - 800 ºC. TGA indicated the dehydration and decomposition of each usnic acid, graphene, conjugate and microspheres. The TGA curve indicated slight abatement in weight of the usnic acid showed a fast weight loss step, which occurred between 230°C and 350°C, whereas it showed a rather slow weight loss over the range of 350 °C - 500 °C. Graphene loses mass upon heating even below 100°C due to the elimination of loosely bound moisture. The major mass reduction at 200 °C caused by pyrolysis of oxygen cont. functional group generating CO and CO2 stream and then remains stable up to 800 °C. Graphene usnic acid conjugate showed weight loss between 250 °C and 350 °C and loses mass upon heating even below 100 °C, the mass of the conjugate further stable up to 800 °C. The prepared conjugate showed more stability as compared to usnic acid and is more thermostable at progressive temperature. Eudragit RL 100 micro-spheres of drug showed a fast weight loss step, which occurred between 100 °C and 200°C, whereas it showed stability at 420 °C, whereas it showed a rather weight loss over the range of 430 °C - 800 °C, and Eudragit RL100 microspheres of Conjugate showed weight loss between 230 °C and 350 °C and loses mass upon heating even below 100 °C, mass of conjugate further stable up to 800 °C. Eudragit RS 100 microspheres of drug depicts a fast weight loss step, which occurred between 230 °C and 350 °C, whereas it showed a rather slow weight loss over the range of 350 °C - 800 °C, Eudragit RS100 microspheres of conjugate showed weight loss between 230 °C and 350 °C, and loses mass upon heating even below 100 °C, mass of conjugate further remains stable up to 800 °C. TGA of formulated microspheres described stability for up to 800 °C signifying its better thermal behavior. 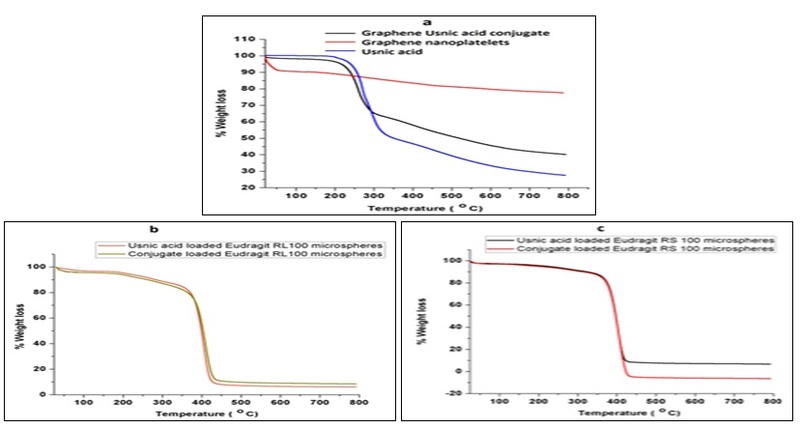 The formulated microspheres of graphene usnic acid conjugate showed better thermal stability as compared to usnic acid, and the microspheres prepared individually by Eudragit RL100 and Eudrgit RS100 also showed better thermal stability as compared to the formulated drug microspheres. Particle Size Analysis: The particle size was dictated using an optical microscope (Olympus Dewinter, New Delhi, India). Approximately 20 particles of microspheres were counted for ceremonious size distribution. The formulated microspheres (batches B1 to B4) were found to have spherical, smooth and regular surface Fig. 3. 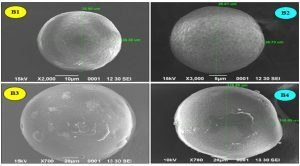 Scanning Electron Microscopy (SEM) Analysis: Scanning Electron Microscopy investigated the morphology of the microspheres prepared. The SEM images of the microspheres are shown in which have a spherical porous surface. It can be seen that microspheres are almost spherical with a smooth surface and no drug crystals were found on their surfaces which might be attributed to the uniform removal of the solvent by evaporation to produce even polymer distribution. Drug Content Studies: Drug content was determined in phosphate buffer pH 6.8 through UV spectrophotometer at λmax 291 nm. B1, B2, B3, and B4 microspheres were found to have 59.12 mg, 65.27 mg, 50.13 mg 54.23 mg respectively. It was concluded that conjugate loaded microspheres possess high drug content attributing to higher absorption behavior of graphene present in it. In-vitro Diffusion Studies by Dialysis BAG Method: It was observed that the release rate of the drug from Eudragit RL100 microspheres was a little higher than that of Eudragit RS 100 microspheres because Eudragit RL100 contains a higher amount of quaternary ammonium groups, which renders it more permeable and accelerates the drug release. 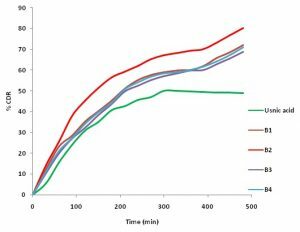 The release rate of Eudragit RS100 microspheres exhibit a lag time at the initial release, and the best release was observed with formulation B2. Moreover, drug release from conjugate loaded B2 and B4 microspheres were found to be higher as compared to usnic acid loaded B1 and B3 microspheres which conclude that formulation of conjugate facilitated more diffusion of drug owing to nature of graphene present in it. In-vitro Antibacterial Study: Antibacterial activity of formulated microspheres was conducted through the microdilution method. 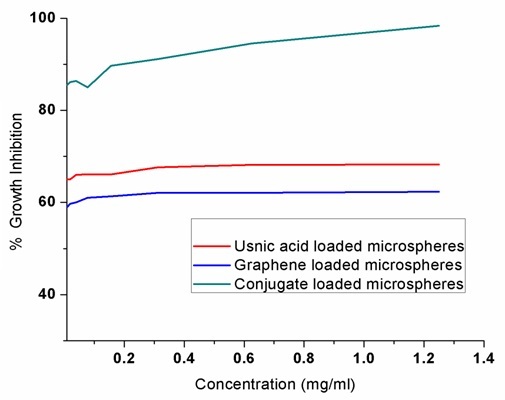 The purpose of the study was to evaluate and compare the potential of usnic acid loaded microspheres and its conjugate loaded microspheres against S. aureus. 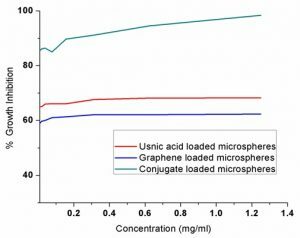 The in-vitro antibacterial study revealed that usnic acid microspheres graphene and conjugate microspheres possess antibacterial activity against S. aureus and able to inhibit the growth of bacteria. The main activity of graphene for antibacterial properties is due to its sharp edges which are responsible for inhibiting the bacterial growth. In Fig. 6, it has been showed that a conjugate loaded microsphere had enhanced antibacterial activity against S. aureus as compare to individual usnic acid and graphene. CONCLUSION: Graphene-usnic acid loaded Eudragit RL100, and a solvent evaporation technique explicated Eudragit RS100 microspheres. The formulations evinced controlled release of drug through the skin, signifying wagerer potential of the delivery system as equated with the arrant drug of usnic acid. The formulation revealed enhanced retention of drug in the skin, indicating meliorate potential of the delivery system. On the grounds of efficacy and improved patient compliance due to reduced frequency of application, microspheres based formulations will have a significantly better role in the systemic treatment of anti-bacterial infection. Formulated microspheres were found to have a spherical and porous surface, facilitating high payload and meliorate drug release. FTIR spectra of microspheres inveterate presence of drug and polymer by predicting wave number of their respective functional groups. TGA analysis showed better thermal behavior with no drug-polymer interaction. Batch 2 microspheres prepared from Eudragit RL 100 showed eminent drug release, attributed to more permeability as compared to Eudragit RS 100 microspheres. The result showed that the concentration of Eudragit RL 100/ Eudragit RS 100 and the concentration of PVA significantly affected the particle size, drug content and in-vitro drug release. Eudragit RL 100 produced B2 microspheres containing with an average particle size of 26 µm, drug content (65.27) and 89% drug release. Batch B2 was reported better as it exhibited maximum controlled drug release. The kinetic data of the in-vitro diffusion release of graphene usnic acid conjugate loaded microspheres was found to pursue Peppas model kinetics, based on r² values giving higher results of B2 than B1. Microspheres system have been found to have good potential for prolonged drug release, enhanced retention of drug in the skin, indicating the better potential of the delivery system and therefore can be beneficial for use in the treatment of various topical microbial infections. ACKNOWLEDGEMENT: We would like to express our profound gratitude to the faculty members to the University Institute of Pharmacy, Chhatrapati Shahuji Maharaj University Kanpur, as well as IIT Kanpur, for their kind help and cooperation in completion of this research project work. Khan QA, Shaur A, Khan TA, Joya YF and Awan MS: Characterization of reduced graphene oxide produced through a modified Hoffman method. Cogent Chemistry 2017; 3(1):1 298980. Das TK and Prusty S: Graphene-based polymer composites and their applications. 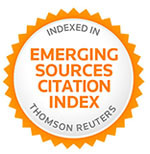 Polymer-Plastics Technology and Engineering 2013; 52(4): 319-31. Chen J, Peng H, Wang X, Shao F, Yuan Z and Han H: Graphene oxide exhibits broad-spectrum antimicrobial activity against bacterial phytopathogens and fungal conidia by intertwining and membrane perturbation. Nanoscale 2014; 6(3): 1879-89. 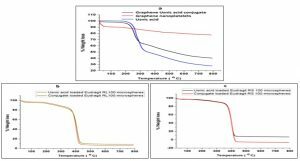 Sawangphruk M, Srimuk P, Chiochan P, Krittaya-vathananon A, Luanwuthi S and Limtrakul J: High-performance supercapacitor of manganese oxide/reduced graphene oxide nanocomposite coated on flexible carbon fiber paper. Carbon 2013; 60: 109-16. Yang X, Zhang X, Liu Z, Ma Y, Huang Y and Chen Y: High-efficiency loading and controlled release of doxorubicin hydrochloride on graphene oxide. The Journal of Physical Chemistry C 2008; 112(45): 17554-8. Du Y, Li D, Liu L and Gai G: Recent achievements of self-healing graphene/polymer composites. Polymers 2018; 10(2): 114. Lou Z, Chen S, Wang L, Jiang K and Shen G: An ultra-sensitive and rapid response speed graphene pressure sensors for electronic skin and health monitoring. Nano Energy 2016; 23: 7-14. Silva M, Alves NM and Paiva MC: Graphene‐polymer nanocomposites for biomedical applications. Polymers for Advanced Technologies 2018; 29(2): 687-700. Badıllı U, Şen T and Tarımcı N: Microparticulate based topical delivery system of clobetasol propionate. AAPS Pharm Sci Tech 2011; 12(3): 949. Basarkar GD, Shirsath GN and Patil SB: Development of microspheres containing diclofenac diethylamine as sustained release topical formulation. Bulletin of Pharmaceutical Research 2013; 3(1): 14-22. Labouta HI and El-Khordagui LK: Polymethacrylate microparticles gel for topical drug delivery. Pharmaceutical Research 2010; 27(10): 2106-18. Cansaran D, Çetin D, Halıcı MG and Atakol O: Determination of usnic acid in some Rhizoplaca species from Middle Anatolia and their antimicrobial activities. Zeitschrift für Naturforschung C 2006; 61(1-2): 47-51. Dehghan S, Aboofazeli R, Avadi M and Khaksar R: Formulation optimization of nifedipine containing microspheres using factorial design. African Journal of Pharmacy and Pharmacology 2010; 4(6): 346-54. Wadher KJ, Nagarkar A, Sahare D and Umekar MJ: Formulation and evaluation of sustained release ciprofloxacin hydrochloride microspheres using synthetic polymers. Int J Pharm Tech Res 2013; 5(2): 773-80. Harsha S, Chandramouli R and Rani S: Ofloxacin is targeting to lungs by way of microspheres. 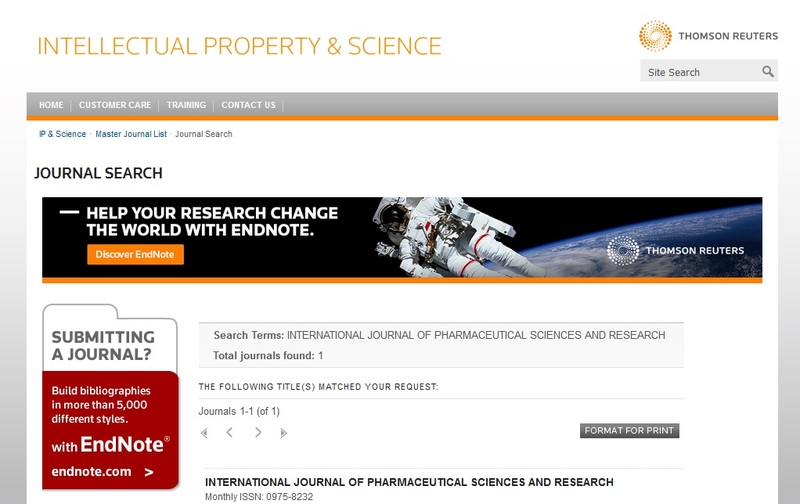 International Journal of Pharmaceutics 2009; 380(1-2): 127-32. Rai SY and Ravikumar P: Development and evaluation of microsphere-based topical formulation using the design of experiments. Indian Journal of Pharmaceutical Sciences 2016; 78(2): 182-92. Midha K, Nagpal M and Arora S: Microspheres: a recent update. Int J Recent Sci Res 2015; 6: 5859-67. Pandey S, Misra SK and Sharma N: Synthesis and characterization of graphene-usnic acid conjugate microspheres and its antibacterial activity against Staphylococcus aureus. Int J Pharm Sci & Res 2019; 10(2): 939-46. doi: 10.13040/IJPSR.0975-8232.10(2).939-46.